For all practical purposes, building AFV models and figures as a "serious" hobby began in the early 1970s, led by Tamiya, Monogram and Airfix. 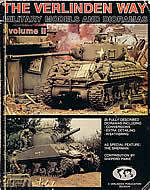 Tamiya offered several basic U.S. AFVs including the M4A3 Sherman, the M3 Lee, the M5A1 Stuart, the Willys Jeep and its amphibian counterpart, and several variants of the M3 halftrack series. 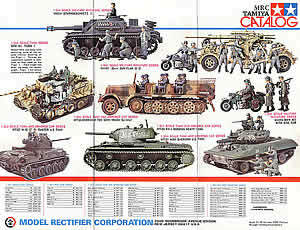 The company continued to periodically reissue these kits, as they produced new German models. While the Sherman is proving it has as many lives as a cat (it has been the basis for four subsequent kits), many of these other kits are lacking in accuracy or details. A number of them were motorized, which compromised dimensional accuracy in order to accommodate motors and batteries. The American company Monogram was Tamiya's most significant competitor in this area, producing 1/32-scale kits that were quite respectable for their day. 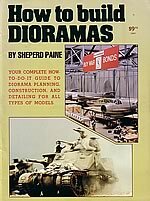 Part of this respectability came from a former GI named Sheperd Paine, who became the first widely recognizable modeler with his smart looking dioramas. Monogram saw his skills as a marketing opportunity and engaged Paine to create a series of instruction sheets, printed in color, showing how to build these kits and use them in scenic dioramas. 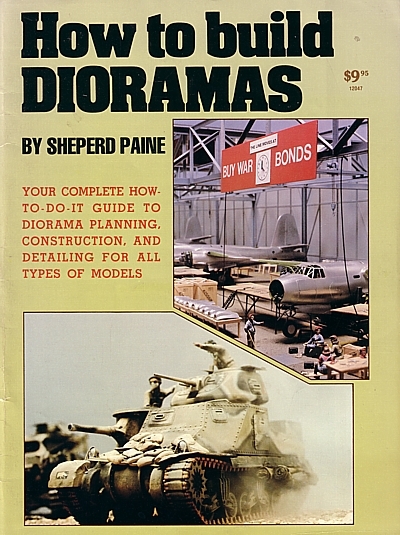 Many now-middle-aged modelers fondly recall these inspiring sheets, and Paine followed them with two seminal softcover books on the subject: How to Build Dioramas and Modeling Tanks and Military Vehicles, still published by Kalmbach books. Alas, Tamiya's growing dominance made 1/35 scale the de facto size for AFV kits, and Monogram was beset with a growing disinterest in "war models" as the Vietnam debacle widened and the poor American economy in the mid-1970s. Ultimately they merged with archrival Revell. The erstwhile 1/32 kits were occasionally reissued up until the mid-1990s. 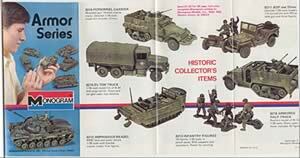 Likewise, Airfix made an attempt in this market in both 1/32 and 1/72 scales. They are remembered most fondly for their "multipose" sets of six and 12 figures, where body parts could easily be mixed and matched to create different poses. While lacking the crisp definition that we enjoy with many of today's injection molded and resin figures, the Airfix GI and Marine sets can still be useful if they can be found. Italeri appeared in the early 1980s. They purchased the molds for a series of Dodge vehicles from Peerless Max, and produced the first models of significant American artillery pieces, the 105mm and 155mm howitzers. Their M4A1 Sherman still holds up quite well today, and they produced an M4A3 Calliope, M36 Jackson, M32 recovery vehicle, M7 Priest and a couple decent Jeep versions. Shep Paine's detailing kits and building dioramas paralleled the interests of a Belgian named François Verlinden, who moved from modeler to hobby store owner to manufacturer of resin update sets, photoetch detail parts and figures. 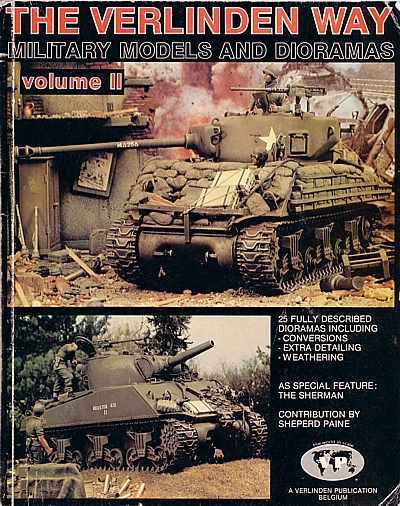 Almost single-handedly, Verlinden launched the "aftermarket" industry for AFV kits, promoting his products through nice color catalogues and a modeling and diorama books. Soon "The Verlinden Way" was road most traveled by a growing number of AFV modelers. For many years, modelers had to satisfy themselves with reissues of the older offerings from Tamiya, Monogram and Airfix and "fix-it" sets from the aftermarket companies. But in the 1990s three factors converged that have really set the course for AFV modeling as we know it today. First, the market was growing because men who first got their taste of modeling as young boys in the 1960s and 70s (like myself) were now older and had more disposable income, more time and the need for a hobby. The second factor was the emergence of the Internet, with web sites and discussion groups dedicated to modeling AFVs. The exchange of kit information, historical research, and how-to tips ignited created a camaraderie among modelers in far flung areas of the world and quickened the learning curve, resulting in innumerable photo galleries of stunning work. Finally, Tamiya began to face some strong competition from Dragon Models Limited in Hong Kong, which was releasing new Mk. IV's and Stugs on a seemingly weekly basis. With the collapse of communism in Eastern Europe, a number of smaller plastic and resin companies emerged, often tackling the more exotic subjects. There has been a resurgence in U.S. and other Allied armor. Perhaps realizing that the German market was quickly being saturated by a growing number of competitors, Tamiya released its first new U.S. WWII tank in more than 15 years, the M4 Sherman, in 1994. In relatively rapid succession (rapid for Tamiya, too slow for us!) they followed with the M8 Greyhound and M20 armored cars, the GMC 6x6 2.5-ton truck, the massive M26 Dragon Wagon, and a newly tooled jeep. DML answered our prayers with an early M4A1 Sherman, a couple of Sherman Firefly variants, and WWII and Korean War versions of the Pershing tank. Several of the Shermans incorporated parts from Italeri's earlier kits. 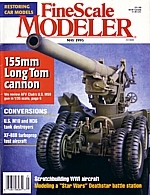 Italeri, however, has been slower to come to the modeler's workbench with new U.S. kits. They had the misfortune of releasing their M8 and M20 armored cars after Tamiya's had already hit the market (while the quality is not quite on par with the Tamiya kits, Italeri's are considerably less expensive). They have broken new ground, however, with the LVT-4 Amtrac and the upcoming DUKW. Even though the Amtrac has been available in (expensive) resin for some time, Italeri's kit has sparked Verlinden and Warriors to produce an unparalleled number of new Marine figures and update kits. 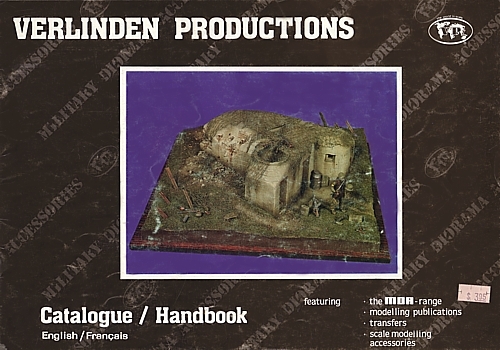 In the mid-1990s, Verlinden moved to the U.S. and merged his production company with the distribution arm run by American modeler and master diorama builder Bob Letterman. The combined operations were victim to internal conflicts and a "divorce" was decreed before the end of the decade. The misbegotten arrangement did result in some lower pricing on Verlinden products, and VLS was forced to acquire several companies, including Warriors and Custom Dioramics, in order to replace the departed production operations. This hasn't had much direct effect on the range of U.S. themed products, however. Three newer companies have also played a significant role in fostering new interest in Allied subjects. 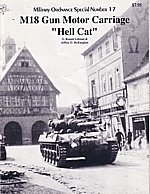 In 1998, Academy (overcoming its earlier history as a purveyor of pirated Tamiya kits) came out with nice kit of the M18 Hellcat - only to face direct competition from a Hellcat produced by AFV Club. Currently the two companies are going toe-to-toe with M10 tank destroyers (Tamiya, perhaps seeking a bit of revenge, reissued their inferior M10 at the same time Academy's hit the market). Academy has also given us the M12 GMC gun and new early Stuart tanks. AFV Club has issued a number of excellent link-to-link track sets for light tanks and Shermans. But perhaps the most impressive offerings came from Skybow, an entry from Taiwan. They took it upon themselves to update the Dodge series with newly tooled versions of General Patton's WC57 Command Car, the WC51 Weapons Carrier and the WC63 truck. These kits, along with their Vietnam era vehicles, have earned rave reviews for their precise detail, accuracy, and "build-ability." Alas, Skybow fell on hard times financially, but the products were picked up by AFV Club. For those with a lot of cash on hand, resin companies such as Accurate Armour, Roy Models and PSP are offering challenging opportunities to build large workhorses like the Diamond T, M1A1 Ward LaFrance and M4 high speed tractor. These vehicles likely wouldn't produce the profits necessary for a plastics company like Tamiya or DML (Nitto produced a dog of an M4 or M5 tractor in plastic that needs quite a bit of work, but it's out of production and hard to find). Towed artillery and anti-tank guns tend to be overlooked by modelers under any flag, and hence there are only a few options available. The most impressive in both size and quality is AFV Club's 155mm "Long Tom." Italeri offers a couple twenty-year-old moldings of the 105mm and 155mm howitzers that need some TLC and detailing to bring to life. Zvezda now reboxes the M1 anti-tank gun from Italeri; this is the American version of the British-designed gun that is available in a lesser quality kit from Tamiya. A metal kit of the 75mm field "pack" howitzer was made by Tamiya in the early 70's but it's a rare find these days. 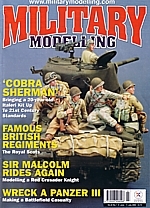 DML, which has risen to the top of the pack with figures imaginatively designed and illustrated by Ron Volstad, has produced just eight WWII American soldier sets over the past decade and even fewer British and Russian figures (French soldiers typically were outfitted with American uniforms and gear). They have churned out over three dozen German sets, including cavalry! We await (only half jokingly) such new sets as "Germans Peeling Potatoes, Ukraine 1943" and "German Signal Troops Polishing Boots." But DML did step up to the plate in late 2003 and 2004 with nice anti-tank and light weapons teams, and an Omaha Beach set to commemorate the 60th anniversary of D-Day. They are now reboxing many of their figure sets to include new weapons and equipment sprues. Likewise, Tamiya has been preoccupied with German figures, though they did release an excellent six man U.S. assault team (we were all hoping their impressive box of 16 Russian soldiers was going to be a new packaging trend, but it came to naught). And the Japanese goliath did serve up some new winter GIs with their two revamped Sherman sets. Italeri had a "Russian phase" in the mid-90s, offering Cossacks on horseback, assault teams and naval troops, but no new Americans since their bug-eyed paratroopers, Marines, and quasi-American figure retreads from Heller, all from more than 20 years ago. There have been more opportunities available in resin, albeit at a higher price. In the past few years there has been a stronger showing of American might in the Verlinden and Custom Dioramics lines. A smattering of figures is found in other product lines. Our greatest hope, an upstart company called YANKS, offered only U.S. and Russian soldiers. They passed from the scene in the late 1990s (the molds were sold to a Scottish company which promptly shut down as well). An attempt to resurrect YANKS failed, though some of the product line has been picked up by Mustang Productions. But two other companiesFormations and Tiger Model Designsare winning many fans with accurate and intricately cast upgrade sets and accessories. And for those into correcting and super-detailing their kits, Eduard and Aber continue to offer a wide and seemingly endless array of photo-etch doodads. The manufacturing side of the industry seems to have a split personality these days. On one hand, they'll take some pretty surprising risks, such as Tamiya's Dragon Wagon and VLS's "superdiorama" sets. And on the other hand, they seem to wait for someone else to take the lead. The airing of Band of Brothers in the fall of 2001 prompted a sudden rush of airborne and melton-coated infantry figures. Italeri's release of the Amtrac has led to a virtual battalion of Marines from Warriors and Verlinden Productions. While VLS's production companies such Custom Dioramics produce some great, unique products, VLS also seems intent on duplicating many of the products from its former partner, Verlinden. So we get new sets of crates, bottles, fuel drums and wicker baskets when what we really need are mess kits, cook stoves, tents, and accurately sized ammo crates and markings. 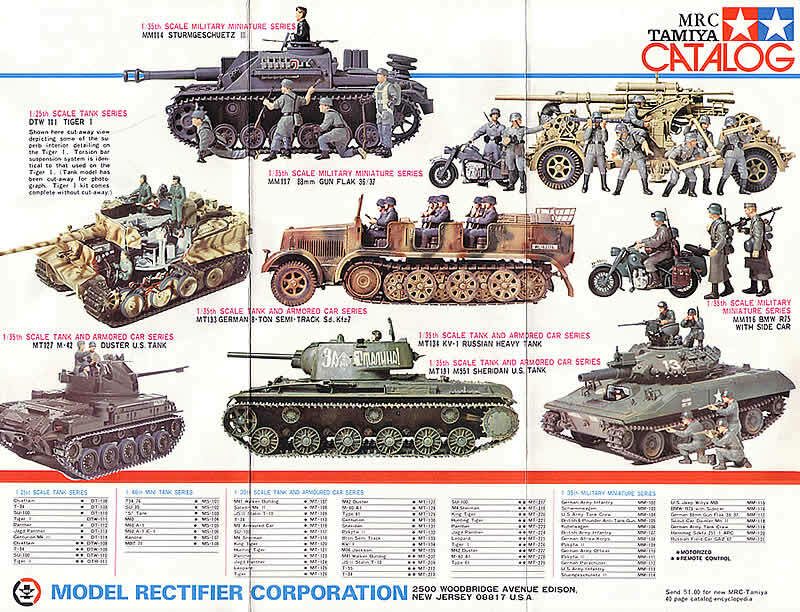 Tamiya seemed preoccupied with 1/16 remote control tanks (funny how we sought to get away from motorized kits, which we smugly thought were for "kids."). 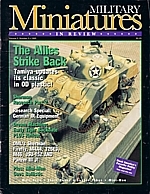 But in late 2004, rumors began to circulate about a new line of 1/48 armor. DML shifted much of its interest away from 1/35 kits and figures in order to concentrate on its more profitable 12" "action figures," and in fact has publicly complained that AFV modelers are too critical of its kits and they may get out of plastic tanks and soldiers altogether! But those appear to be idle threats, as DML began branching out into 1/72 scale kits, perhaps following the lead of Italeri and Revell. The wars in Afghanistan and Iraq have also taken modeling resources and attention away from WWII. These fronts in the "war on terrorism" are in many ways more akin to the conflict in Viet Nam than to fight against fascism, particularly with regard to public sentiments. At this point, it's unlikely they will have the negative affect on modeling AFVs as Viet Nam had with all sorts of military toys and hobbies. There is a renewed respect for veterans from all U.S. wars, especially as we witness the inevitable passing of "the Greatest Generation," with over 1,000 vets making their final roll call each day. But they will not pass from memory as long as we modelers continue to commemorate their service and sacrifice in our own small way.